I have just come from caring for our grandson, which I do every morning, and of course I read to him endlessly, for 45 minutes at a time on occasions, although he is only nine months old developmentally. He was born two months premature. Many, but not all of these books are in board book editions, so if—as you’re reading—you separate the next/following page with your fingers and get it ready, your child will quickly learn how to turn the pages. 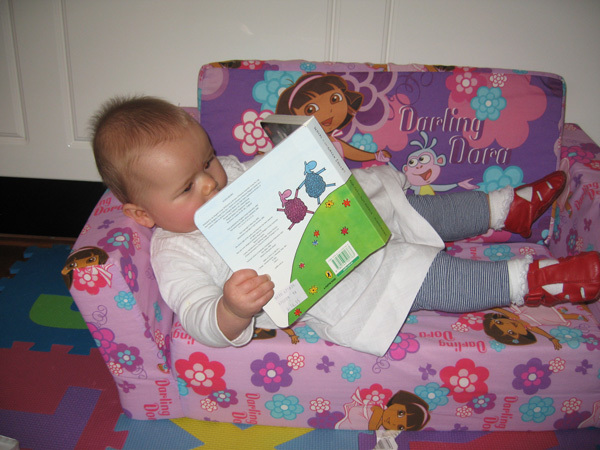 My grandson learnt to turn the pages when he was five months old. He LOVES doing it. I might post this entire email on my website later, without your identifying address, if you give me permission. What do you say?